From eclairs and cream puffs to tarts and brownies, our assorted dessert pastries are a fabulous way to end a meal. Stop by Jarosch Bakery today and explore our wide selection of options. Jarosch Bakery eclairs are made using traditional pâte à choux dough filled with our homemade custard for a unique twist. We drizzle rich chocolate over the entire pastry for a decadent finish. 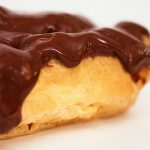 A top seller, our eclairs come in regular and miniature sizes. 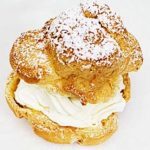 Like an eclair, the cream puff is made from French choux pastry dough. The similarities stop there: while the eclair is long, the cream puff is round. Once we slice the pastry in half, we generously fill the cream puff with airy, delicate whipped cream and sprinkle it with powdered sugar. Also available in miniature. For a tasty treat with just the right amount of sweetness, try a fresh Jarosch Bakery tart. We add an enticing twist to our tarts by making the shell out of cookie dough. 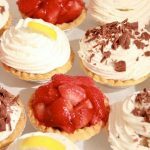 We fill them with lemon, sliced bananas & custard, strawberries, or chocolate custard, and top most of them with fluffy whipped cream. Dark, rich, and chewy, our fudge brownies are the perfect choice for any chocoholic. 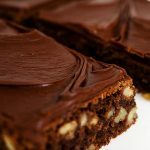 We mix crunchy pecans and walnuts into the batter and ice the brownies with a creamy fudge frosting. Even with nuts, these brownies have remained a customer favorite for decades. 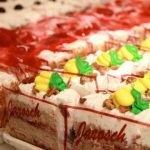 Try a truly singular dessert from Jarosch Bakery. 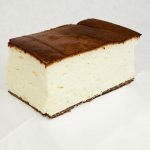 Different from traditional cheesecakes, our Cheese Cake Loaf is made with baker’s cheese rather than cream cheese. The addition of whipped egg whites and flour create a light and fluffy cheesecake that will wow your guests. If some of your guests like chocolate while others like fruit, grab a selection of cake slices so you’ll have a little something for everyone! Available daily in a variety of flavors, our whipped cream cake slices are a perfect way to sample Jarosch cakes and fillings.